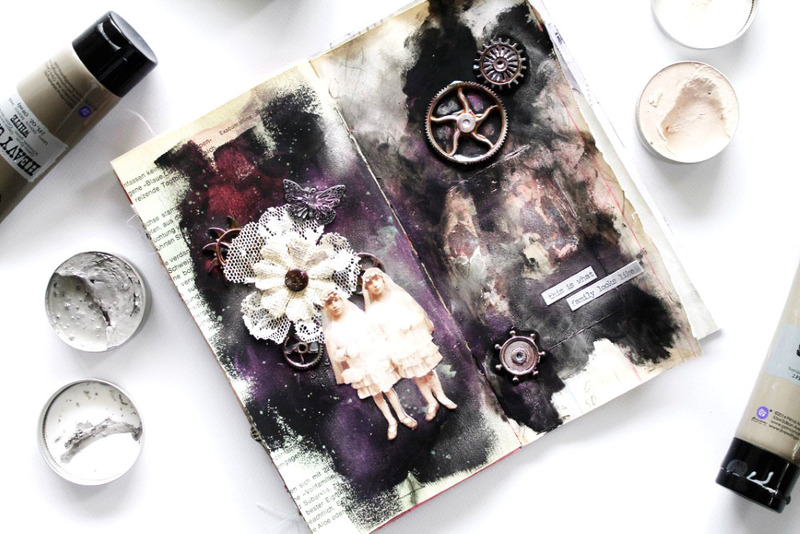 What do you get when you mix Mechanicals + Waxes + Gesso? We know it is going to be something amazingly textured and stunningly beautiful! 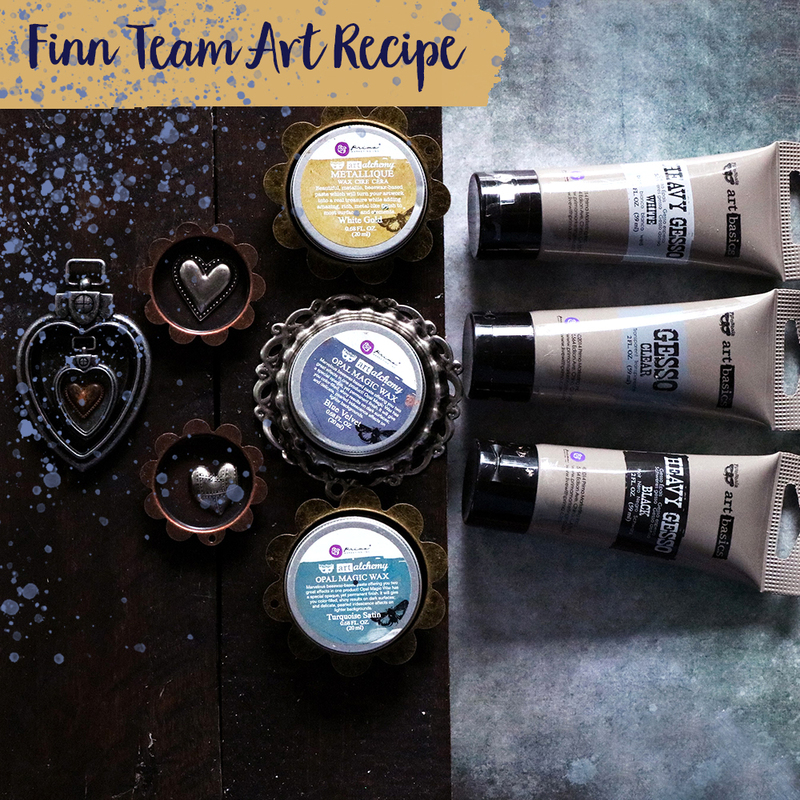 This month's Art Recipe by Finnabair includes three very special products from her lines. 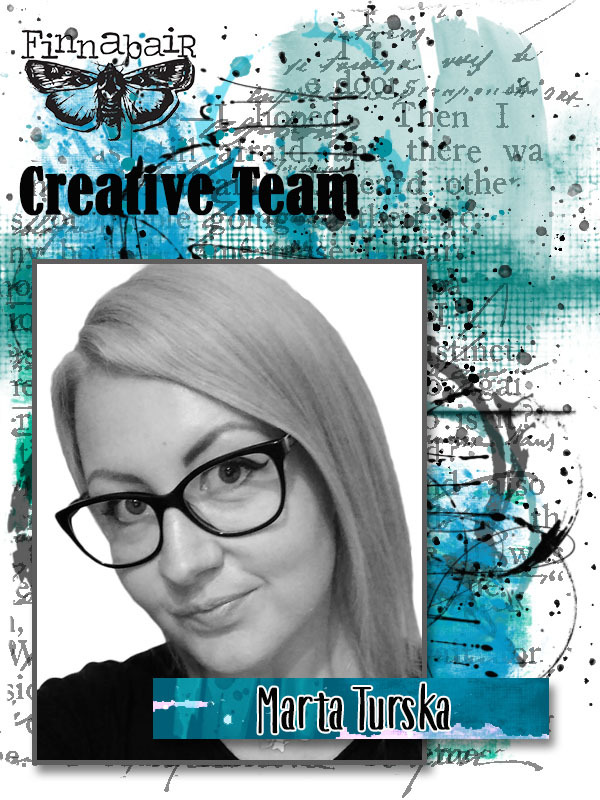 Come see what her design team created with them AND see a sneak peek of her Facebook Live project for today! 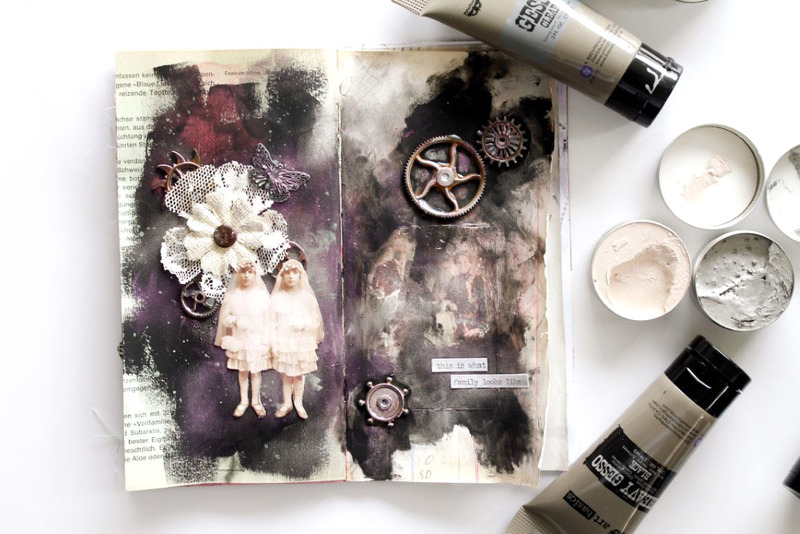 My art journal is a sacred place, and this particular, hand-made journal features spreads all based on stories from my life. 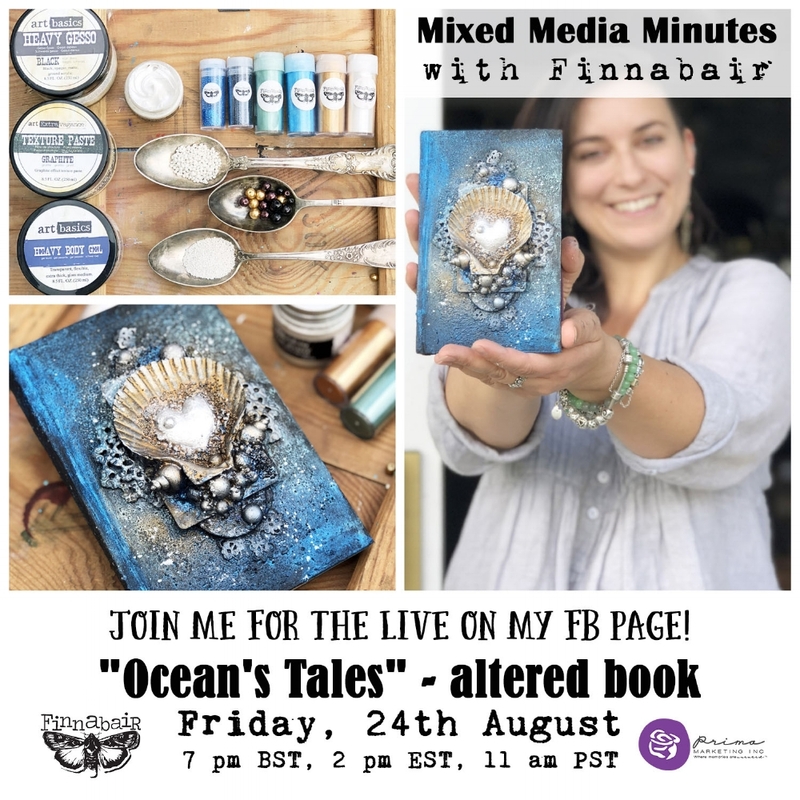 It is filled with vintage papers so I decided to use some of Finnabair's Gesso, Wax and Mechanicals to tell a story about families. I started by putting down some Black Gesso in a rough way with a dry brush to create some texture. I followed that with Opal Magic Wax called Royal Robes. It turned a gorgeous Metallique pink on the Black Gesso and created a kind of galaxy feel on the background. I also used some Old Silver Wax to enhance that feeling. Next I placed some alterable flowers, Mechanicals, and a fussy-cut vintage photograph, then glued them down with 3D gel. To finish off the spread I rubbed some more wax over the Mechanicals to blend them into the background, and I added some sentiment stickers for my journaling. The spread took about half an hour to complete and is true to my minimalist art journaling style. 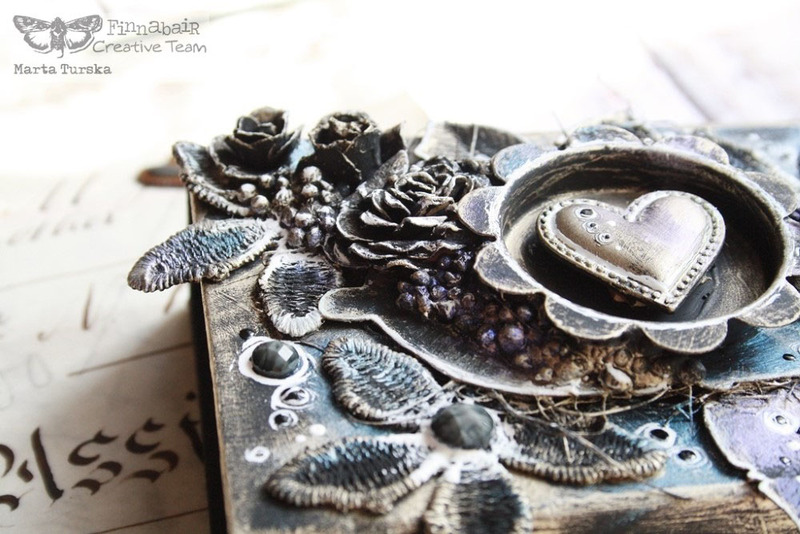 For this month's Prima Art Recipe I created a box which is full of magical shine and dimension. It was a box that came with a memory stick and I decided to alter it to create something beautiful and useful! When I created my composition, I covered it with black gesso using a brush. I wanted to make sure that I will cover every little stone or a flower with a layer of black gesso. Later on, when gesso dried, I covered some elements of my composition with three mixed waxes. I applied them with a brush to make sure they will create a beautiful, shiny layer. In the end I highlighted some places with a white ink gel pen - it added extra dimension to my composition. 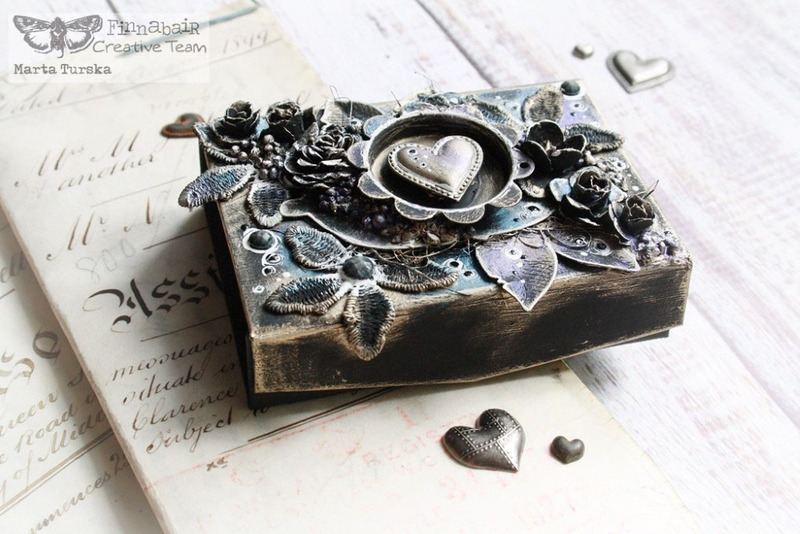 I hope you like my creation and that you will try to create something beautiful using a bit of gesso and amazing Finnabair waxes! 963897 - Art Basics: Mixed Media Silicone Brush 1"
963361 - Mechanicals: Tin Hearts 10pc. 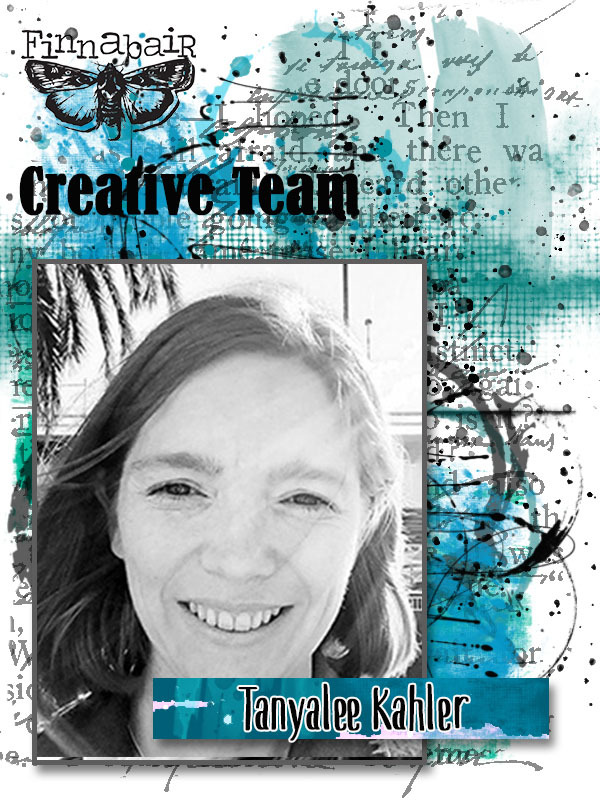 Today I am sharing with you a mixed-media canvas. I used Impasto Paint in Aubergine to make a background, like an old wall in one of the rooms of an ancient mansion. Heavy Gesso Black was used to cover the decor and the whole canvas. Next I added Impasto Paint on top with Wax on the embellishments. I also added a little Mica Powder, for a mystical blue shine. I wanted to use our recipe in a very simple and easy way. Black Gesso + Wax are already very beautiful! Impasto Paint in the background adds contrast and effect. A touch of Mica Powder adds radiance! I hope I could inspire you to use our recipe to make a beautiful thing!